Reactionary right-wing politics are on the rise in the west, and events are moving at a dangerous pace. 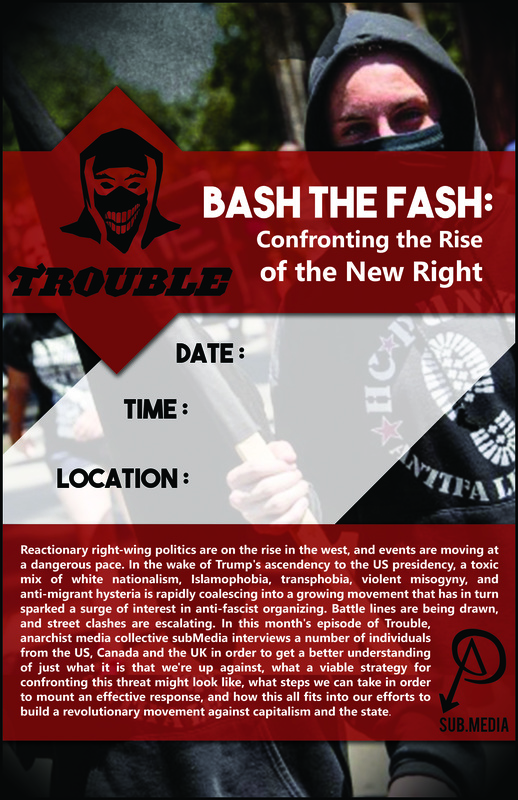 In the wake of Trump’s ascendency to the US presidency, a toxic mix of white nationalism, Islamophobia, transphobia, violent misogyny, and anti-migrant hysteria is rapidly coalescing into a growing movement that has in turn sparked a surge of interest in anti-fascist organizing. Battle lines are being drawn, and street clashes are escalating. In this month’s episode of Trouble, anarchist media collective subMedia interviews a number of individuals from the US, Canada and the UK in order to get a better understanding of just what it is that we’re up against, what a viable strategy for confronting this threat might look like, what steps we can take in order to mount an effective response, and how this all fits into our efforts to build a revolutionary movement against capitalism and the state. Excerpt from “Street Politics 101” that retells the story of MayDay 2012 during the raucous student strike of that year. What if you had to risk everything to escape war? Would there be strangers on the other side, willing to help you and you family to safety?